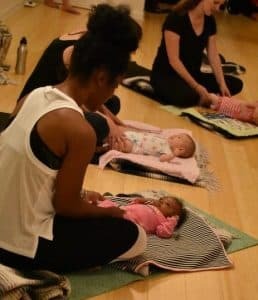 Lighthouse Yoga Center is thrilled to be partnering with Breathing Space to provide a full schedule of Family Yoga, Yoga for Kids, Yoga for Tots, and Baby and Me Yoga classes. arenting and breastfeeding support, infant massage and more. With so many families and children in the Petworth/Brightwood area, Lighthouse believes this partnership will allow us to run high-quality family classes perfectly suited to our community. Tot Yoga, crawling to 24 months, Tuesdays 9:45-10:30 am. Next session starts May 14. Little Family Yoga, ages 21 months to 4 years, Tuesdays 10:45-11:30 am. Next session starts May 14. Baby Yoga & Play (pre-crawlers), Tuesdays 11:45 am-12:45 pm. Next session starts May 14. All family and kids yoga registration is done directly through Breathing Space, and please direct all inquiries to them! Are you interested in a private event for your child? Contact us about birthday parties or other kids yoga events.